My kids, my friends and everyone else in better love my Paleo Yorkshire Pudding! The perfect side to a roasted chicken, prime rib or what ever your little heart desires for those happy faces at the dinner table! The best way to do this is – adding the ingredients in your blender; let it sit for 10 minutes or until your oven is preheated. 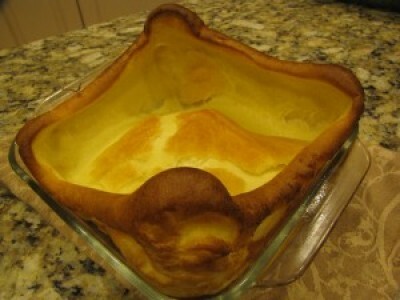 Remember a few basic rules about making yorkshire pudding or popovers. Sorry – but yes there are rules! Add eggs, milk, arrowroot powder, salt, pepper and butter in your blender. Then add in 1/4 cup of your drippings or broth and blend again. Let sit for about 20-30 minutes or until your oven preheats. Once the drippings are really hot carefully add the batter into the prepared pan. Bake for 30 minutes or until the top is puffy and brown and the middle looks cooked through.